Finstall author Jennie McGregor-Smith, whose previous works have covered the Victorian expansion of Bromsgrove, Aston Fields, Blackwell and Burcot, has turned the spotlight on her own village with a new book called The Story of Finstall. Jennie’s incredibly detailed research follows Finstall’s journey from the 1640s – when there was no village centre, just a few small farms and hovels – to the 1940s, when a German plane dropped high explosives in the grounds of the Prep School, and the privations of rationing led one family to swap their Austin 7 Tourer for half a pig. These are just some of the anecdotes to be found in this fascinating book, which will appeal to anyone who enjoys finding out more about their home area and to older residents who will actually recall some of the places and characters in the latter stages of the story. The author, who was awarded a British Empire Medal in the 2018 New Year Honours list for services to her community, says she thoroughly enjoyed researching and writing the book “because I found out such extraordinary things”, especially the information on the Civil War. We learn that The Cross Inn, where the book was launched, has been a pub since at least the 1780s – and that there was once an ale house by Finch End farmhouse, as well as The Boot Inn, now Coombe Cottage (Jennie notes that hops still grow in the hedge there). Later, she tells how the face of Finstall was changed by the arrival of several major families such as the Albrights, the Ellins and the Brettells; Quaker industrialists from Birmingham and the Black Country. After William Albright of Finstall Hall died, it was his daughter Catherine who arranged for the Village Hall to be built on Albright land, as well as the new Post Office and the allotments. Then there are stories about the well-known buildings in Finstall. Rigby Hall, for example, was briefly the home of “Salt King” John Corbett, who arranged annual parties for local children, and some years later the building was used by a Government Ministry in World War II. The Stud Farm, where Penmanor is now, was renowned for breeding racehorses, while current residents of The Oakalls will be interested to learn more about the farms that preceded the housing development – as well as the tenants whose divorce case in 1915 was so scandalous it was even reported in The Times. Jennie introduces us to various village characters, such as a trio who all lived to be 100 or older in the late 1890s (when average life expectancy was a mere 47 years), including Joseph Guise, the longest tenant of Caspidge Farm, who had lost an arm in a threshing accident. Further trivia includes an accident involving a beer train in 1881, causing the local fields to be “deluged with beer”, and details of some rather harsh punishments for petty crime. 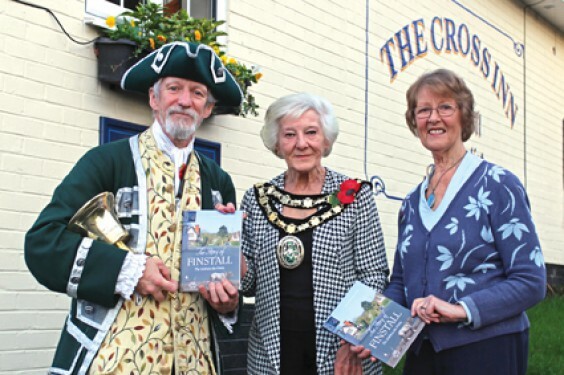 Above: Jennie McGregor-Smith (right) with Chairman of Bromsgrove District Council Caroline Spencer and Town Crier Kevin Ward at the book launch.